When it comes to wash day routines, there are people who find success on two opposite ends of the spectrum. I'm referring to those who wash frequently and those who don't. Proponents of frequent wash days boast about increased retention while some advocate leaving the hair alone which also promotes length. Neither option is right or wrong, but let's discuss some pros and cons of both so you can decide which choice is best for you. If you wash your hair 2 or more times a week, you can consider yourself a frequent washer. I've written a complete post on the benefits of this type of regimen. Basically, you expose your hair to water multiple times a week, thereby increasing moisture levels. The need for daily moisturizing and sealing diminishes as your hair is better able to retain moisture on its own. Frequent washers attribute their length retention and progress to this method. I gave it a go for several weeks and my hair approved. Unfortunately, since I'm a loser at air drying, which meant that I was roller setting multiple times a week. Yes, that's a lot of manipulation, but as moisture levels rose, I barely lost any hair. The time commitment involved caused me to go back weekly wash days, but I'm currently experimenting with an alternative method that I'll write about in an upcoming post. If you have chronically dry hair, frequent washing may be just the answer you're looking for. The key to success, using this method, is to manage the manipulation. If you can find a low manipulation way to handle your hair after cleansing, you're as good as gold. One other pitfall to be aware of is over moisturizing the hair. When the hair becomes over saturated with moisture it can feel week causing you to lose out on making any progress. Lastly, let's never forget the issues of some of WEN's customers who claimed to have experienced hair loss from using their cleansing conditioner. I saw my mother in law earlier this year who raving about how amazing her hair felt after introducing WEN to her regimen. After complimenting her hair, I advised her other's experiences to which she replied "you may be right, I do notice that I shed more hair when I use their product." So keep an eye on that kinda stuff just to make sure you aren't doing more harm than good. But, if you hair loves frequent exposure to water, frequent wash days can take your journey to the next level. I've met people who wash their hair every few weeks and claim that this is their secret to retention. I get it. Leaving your hair alone can have a huge impact on manipulation related breakage. Back when I'd get my hair professionally straightened, my hair could go two or more weeks without issue. It required just a tiny bit of finger combing each day. Detangling was a breeze because shed hairs are easy to remove when your hair is so straight. If I incurred any breakage, I'd just mist with a little It's a 10 with Keratin and call it a day. At one point I contemplated using this method to promote retention. But then I remembered how much manipulation and heat was required to get my hair to that point. There was a girl at the dominican salon who has the most amazing hair. Her hair was probably close to waist length, jet black, and had so much volume (think Kenya Moore's hair but a little bit longer). Based on our brief conversation, she seemed to be a regular patron. I only visited once every 6 months or so. A couple years passed, and I decided to visit the salon out of the blue. That day she just happened to be there, only now, her hair was around bra-strap. It still looked good but no where near where it was during her glory days. That's realized that my hair wouldn't do well if I tried to keep it bone straight 100% of the time. Another issue is my scalp. Going without washing for more than a week can be asking for trouble if you've got scalp issues. I'm sure the people who can endure extended times between wash days have little scalp concerns. I had to leverage anti-fungal oils like coconut and essential oils to make it through the experience. But with all that said, there's some merit to successfully creating a process where the hair can thrive if you only wash once or twice a month. Many of us, including myself, full under the category of washing once a week. For me, washing once every 7 days came about out of convenience. I worked 5 days a week and the weekend was a best time to wash, deep condition and set. But in all honesty, a once a week wash (in it's current form) isn't optimal since my hair responds better to washing more regularly. Once a week is adequate but frequent washings would be ideal. For others who use heavy heat to straighten after washing, extending wash days to every 1.5-2 weeks might give hair hair a much needed break. Or, if weekly is just right, then keep going. And by just right, I want you to think of retention as your measure of success. Retention is made up of how your hair behaves from day to day. 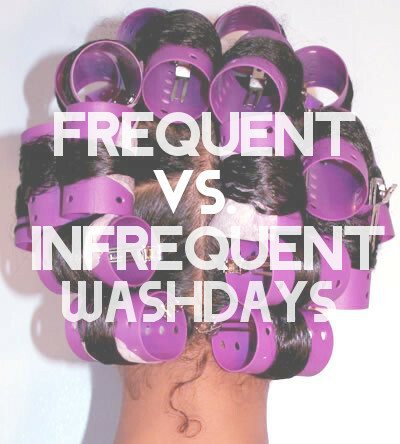 If you're constantly battling dryness and breakage, play around with increasing wash day frequency. If your hair likes to be left alone to do it's thing, try extending and see what happens. Don't just stick to weekend wash days out of convenience, make sure it's truly adding value to your hair. I'd love to hear your experience. Does your hair thrive more when its washed frequently or when left alone? I think it depends on your life style and what you put into your hair. If you travel with public transport, working with a lot of people your hair will contain a lot of bacteria and dust. If you exercise a lot, you will sweat and the dried up sweat will stay on your scalp. Also if you put on a lot of layers with leave ins, moisturizers and oils everyday on your hair it will very soon have s lot of build up. Going with that for over w week and just adding more moisturizers on top of that might not ruin your hair but I find it disgusting to put my head with that hair on my pillow when I sleep at night or put on a clean hat eyc. The scalp is skin and just as you need to clean your face you need to make sure your scalp is clean. Having said that, I think that if you use a minimum of leave ins and oils, brush through your hair every night and morning, wear it loose a few hours a day so the scalp can breath and shake off some dead skin cells, I think it is possible to wash your hair every 2 weeks and still keep it fresh and the scalp healthy. Adding more leave ins on a hair that hasn't been washed for 5 days would be to me like putting deodorant on in the morning without showering first. My hair definitely responds better to frequent washing whether it's relaxed or natural. The only time frequent washing doesn't work for me is when, of course, I am using shampoo. When I was relaxed, I cowashed almost every day in the summer. I scarcely shampooed. I remember that period being the easiest time I've ever had with my hair as far as retaining moisture and detangling (omg, detangling was a BREEZE!). But, I agree, having to constantly manipulate my hair to dry was inconvenient and potentially hazardous to my hair's health. When the school year started, I reduced wash days (shampooing, DCing, etc.) to once a week/every other week because I could not be bothered to manipulate my strands every day. My hair did fine, but its manageability was nothing compared to when I washed more frequently. i wash my hair once or twice per week. I have not watch how my hair gets on when i wash it once. I will keep a close eye on this... Since i am lazy with my hair lately i will go for the infrequent washing, yeahhhhh!!! Like everyone else so far, I lean more into the frequent washing being better group. The key to healthy hair is a clean scalp and moisturized hair, so I just don't like the idea of going weeks without washing your scalp. I've been talking about my view on it lately in my posts, like the one below, where I also referrenced your WEN post.